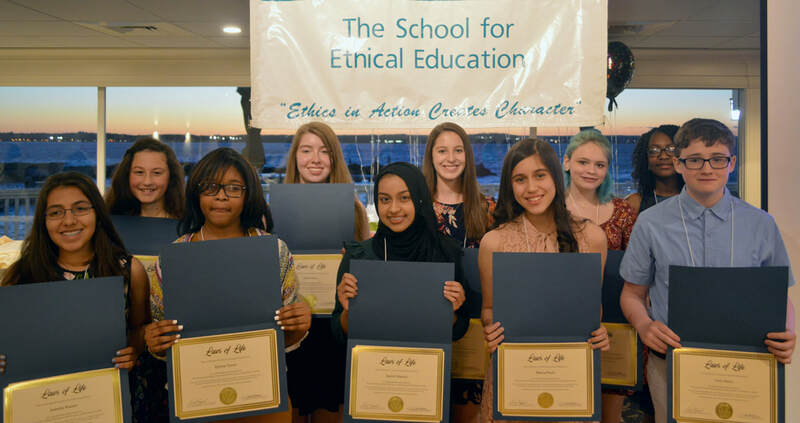 Thank you for your interest in our 2019 Character Celebration that includes our Ethics in Action Award and recognition for our students cited for their Laws of Life essay writing and Academic Integrity PSAs. This year the Celebration will be held on May 1, 2019. Mr. Larry L. Bingaman, President and CEO of the South-Central Connecticut Regional Water Authority is SEE's 2019 John Winthrop Wright Ethics in Action awardee. Mr. Bingaman was nominated for his commitment to and demonstration of ethics and character in his leadership roles. ​Location: Amarante's Sea Cliff, 62 Cove St, New Haven, CT. The following RSVP is sought from all who would like to celebrate the achievement of 2019 winning students in SEE's Laws of Life Essay writing and Academic Integrity PSA contests and Mr. Larry Bingaman as SEE's Ethics in Action ​awadee. ​Donations can be made below to support SEE's school program participants (students, two family members, teachers and volunteer judges). All others who are attending may reserve and purchase their seats with any major credit card. ​​RSVP is required by April 18, 2019. If you do not receive an RSVP confirmation email within one business day, please contact ethics@ethicsed.org. Yes No, but I'd like to sponsor others. Please indicate which program you were involved in as either a student, teacher or judge. If you would like to pay for your own seating or sponsor seats for SEE school program participants ($125 each) ​or a table (ten guests = $1,000), please select from the options listed in the dropdown box below and complete the sponsorship with PayPal here, or send a check to SEE at 326 West Main St., Suite 204, Milford, CT 06460.